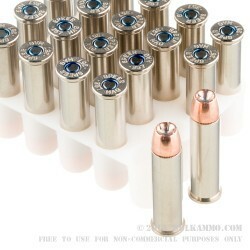 This 357 Mag cartridge by Speer features a 125 grain jacketed hollow point bullet. 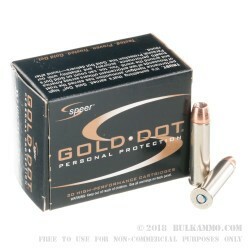 The projectile from the manufacturer’s Gold Dot line features an alloyed lead core with an electrochemically fused jacket, which are virtually inseparable from one another upon hitting a target. The round’s reliable and sensitive CCI Boxer primer ignites its clean burning propellant to deliver optimum velocity and consistent chamber pressure. Its brass casing is nickel plated, giving it both superior resistance to corrosion while lowering its friction to promote smooth, reliable feeding. The result of this combination of features is a powerful, very damaging cartridge with a 1,450 fps muzzle velocity that you can confidently rely upon for self-defense. Speer’s record in the ammunition business dates back to 1943, when their founder began producing bullets for handloaders stymied by the war effort. 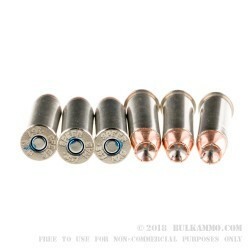 They now maintain a great reputation for the quality of their ammunition, particularly among law enforcement professionals.